IN MONTANA’S BITTERROOT VALLEY, a narrow road winds east toward the foothills of the Sapphire Mountains. Century-old cottonwood trees stand like sentinels among the wide-open fields, and in many ways, the landscape hasn’t changed much under their watch: Cattle still graze, small creeks meander through the valley bottom, elk and deer come down from the hills and the houses are few. The road passes through an iron gate, climbs briefly, and suddenly reveals a home nestled seamlessly within this bucolic setting. 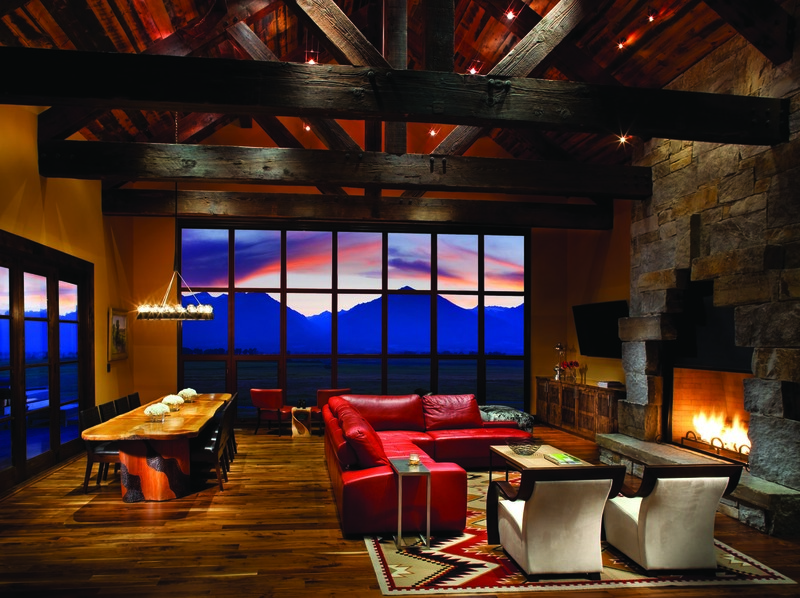 Like many Montana homes, it takes its architectural cues from the area’s ranching and agricultural heritage as well as from the land itself; the roof’s peaks mirror the surrounding mountains and the exterior design and materials are reminiscent of barns and bunkhouses, complete with cupolas and vertical siding. That, however, is where the comparison between this home, and so many other showcase homes in Montana, ends. While there are countless fine houses in the state, few are truly beguiling. And at first glance, it’s hard to put a finger on what it is that sets this home apart. 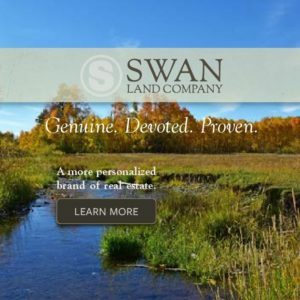 Designed in 2006 by Jerry Locati of Bozeman-based Locati Architects, the place is full of quiet delights and surprises that reveal themselves gracefully. Only after spending time in the home and observing closely does it become clear that one word was paramount in designing and executing this home: Detail. 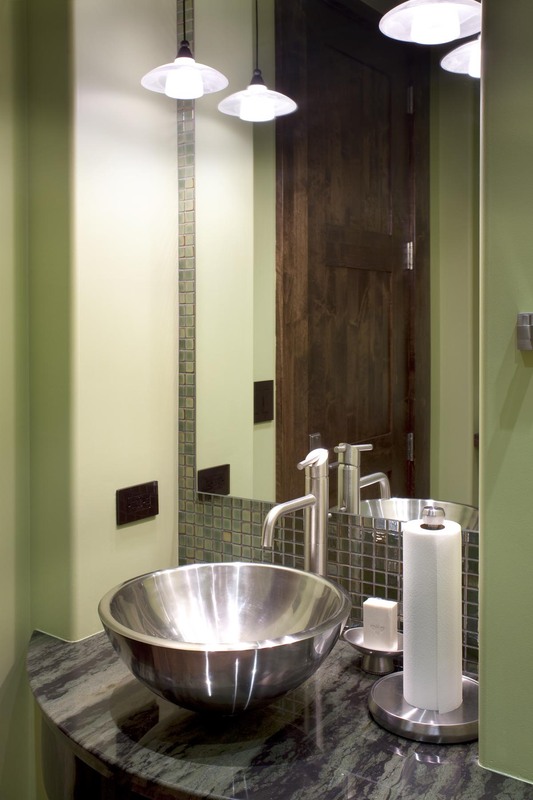 From the broadest aspects, such as the siting of the house, to the smallest, such as the beveled edges on the counters in the powder rooms, the design displays an attentiveness and deliberateness that are rare to find. This is not to suggest that the home is fastidious or fussy; quite the contrary. Truly meticulous design means that all of the aspects work in concert and no one facet draws too much attention. Such is the case here, where the overall impression is welcoming, harmonious, unpretentious and, above all, effortless. Perhaps part of what makes the home feel so singular is that it is beholden to no particular style. “The homeowners’ taste trends more toward the contemporary,” says architect Jerry Locati, “but they really wanted to tie that in with Western elegance as well. They were way ahead of their time.” The result pairs clean lines, a commercial kitchen and expanses of storefront glass with timberframe details, reclaimed wood and rustic stone. 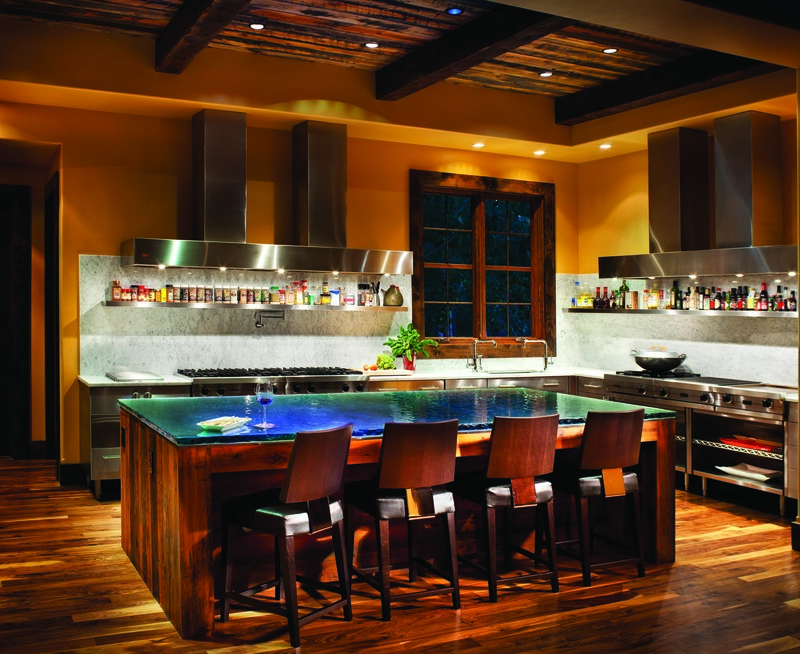 Walnut floors offer timeless, ancient elegance, while an LED-lit glass countertop in the kitchen is thoroughly modern. Built by Utah-based RW Construction, the execution of the design is flawless, from the adobe-like feel of the rounded corners on the walls, to the whimsical cement floor in a studio space. Similarly, the home plays with space in simple yet compelling ways. For instance, the ceiling height changes subtly from room to room — six inches difference here, a foot there — making some rooms cozier and some more lofty. But like so many things in the home, the difference is one that you feel, rather than one that you consciously see. Most striking is the relationship between inside and outside. “We really wanted to create an indoor-outdoor feel,” says Locati. 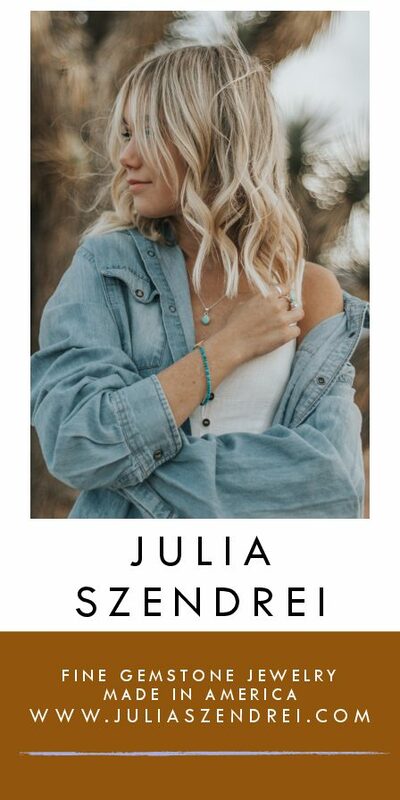 “The whole reason people come to Montana is to enjoy the view and the climate, so you want to really be able to open up your house and be a part of it.” In light of this, every effort was made to render the line between in and out permeable. 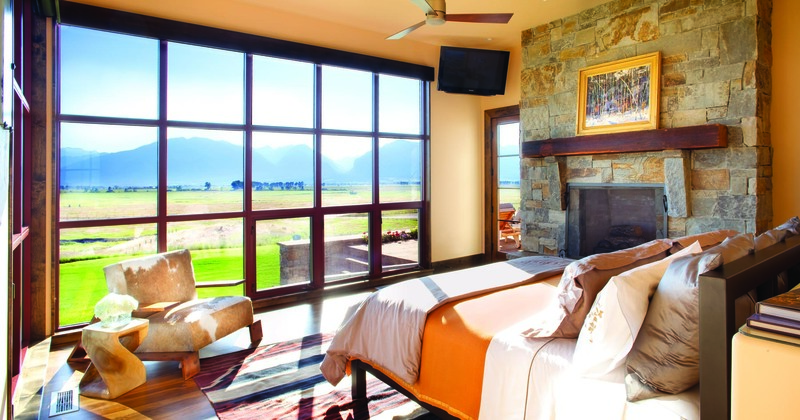 Two whole walls of the humble master bedroom are devoted to floor-to-ceiling windows. An artist’s studio boasts glass garage doors on both ends that afford an open-air, breezeway-like space. The living room’s west wall is a span of industrial windows, not just framing the view, but making it the focal point of the home’s main gathering area. Outdoor seating, barbeques, raised-bed gardens and a fire pit all suggest that the living space extends well beyond the walls. 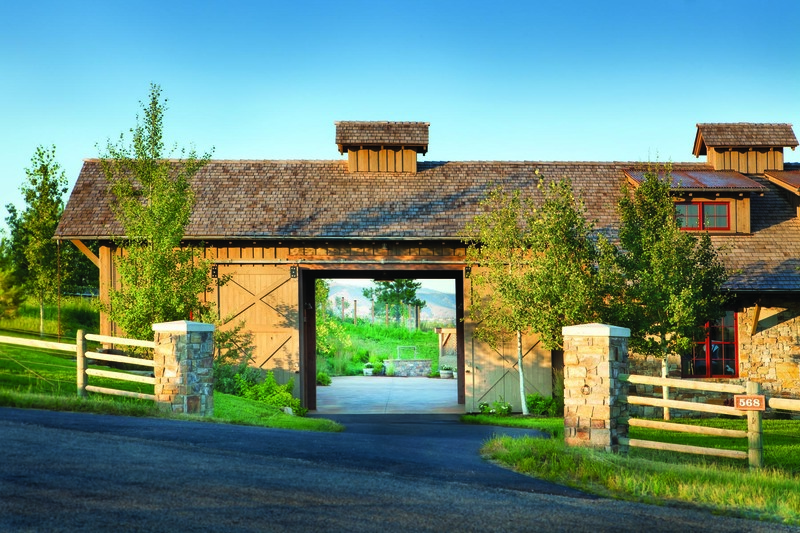 Perhaps the greatest example of this indoor-outdoor relationship comes when you first arrive and the home lures you in via an intriguing series of entryways: First, a driveway ushers you through massive barn doors and into a courtyard. 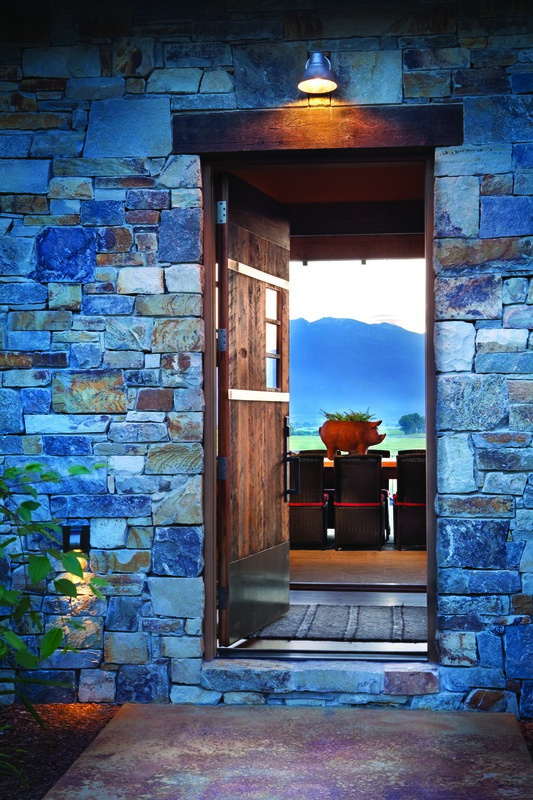 Then, a small, unassuming, barnwood-and-steel front door opens to reveal not a foyer or living room, but one of the most impressive views in western Montana. Visitors arrive in a long, curved hallway, one side of which is entirely windows and glass doors, opening onto an expansive patio. The vista beyond is breathtaking, featuring wide-open pastureland and the Bitterroot Mountains to the west. The home is at once stately and comfortable, with massive reclaimed timbers, a homeowner-designed fireplace and views from every room. 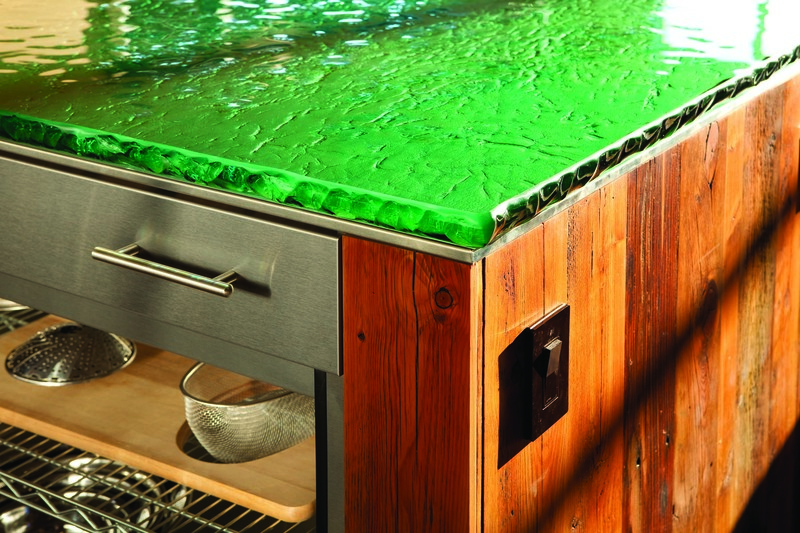 The green glass counter offers a touch of color to the industrial-style kitchen. 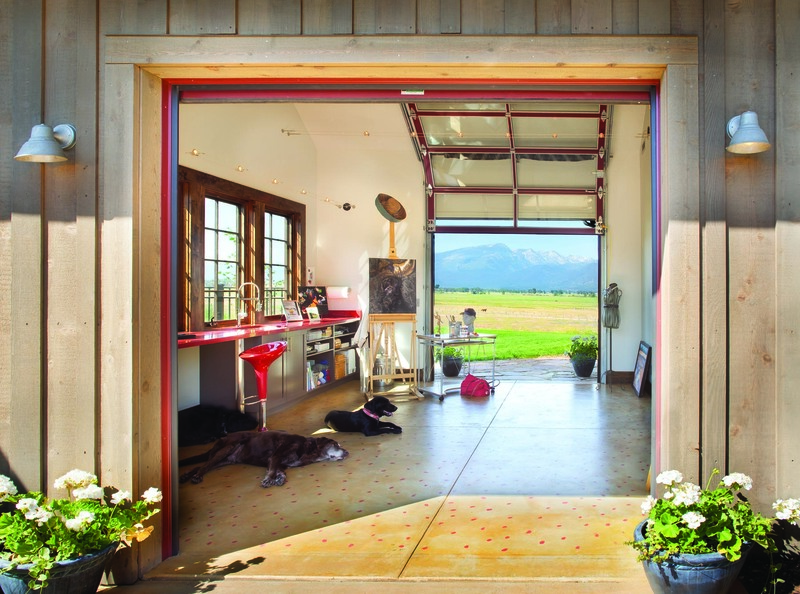 A sliding barn door ushers guests through to the courtyard. The kitchen is both beautiful and utilitarian, with reclaimed wood and industrial ranges. An entire hallway of windows opens toward the Bitterroot Range. 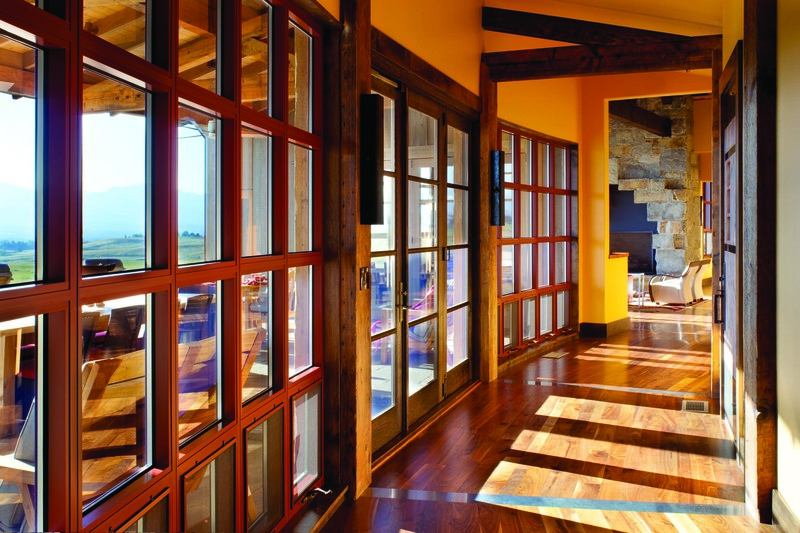 The humble front entry opens to a dazzling view. 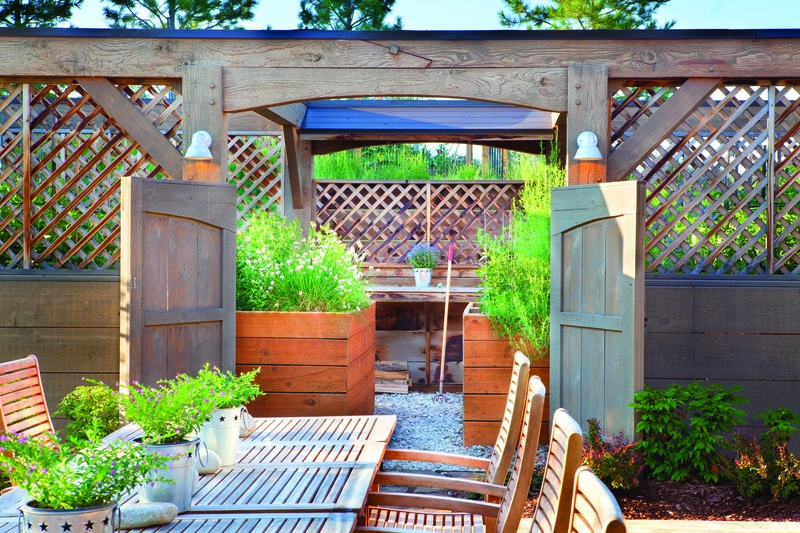 Outdoor seating and a raised-bed garden make this the perfect spot for summer relaxation. The simple master bedroom evokes the feeling of sleeping outdoors.